That’s the sound my right hip has been making for months now. I stand up from a seated position: pop. I sit down with my knees slightly apart: pop. I finish a run and stretch: pop. My body has been snapping, crackling, and popping for as long as I can remember. I’m the girl who has had arthritic knees since she was a teenager. So when this new popping started, I didn’t think anything of it. I figured that it just came with the territory (being thirty and having a history of arthritic joints), and that it was just another thing added to my list of things to live with. Fast forward to after the Flying Pig Half Marathon (post forthcoming). I ran a few weeks later and something felt off. My gait wasn’t the same, and there was just something not quite right with my right hip. It didn’t quite hurt, but it didn’t really feel good either. I let it go for a few more weeks, thinking that it was just due to over training, exhaustion, and whatever else comes with running your first half marathon. Then the waking up in pain in the middle of the night started. I’m a side sleeper, and when I can’t sleep on my right side, I am NOT a happy camper. Last week, having thought back, trying to remember the last time I slept through the night without waking up in pain, I realized that I haven’t slept through the night since May. Two months of not sleeping through the night is not cool, and something needed to be done. I called a chiropractor and set up my very first appointment. The assessment was very thorough and informative. They asked a lot of questions, took several X-rays, and evaluated my range of motion. 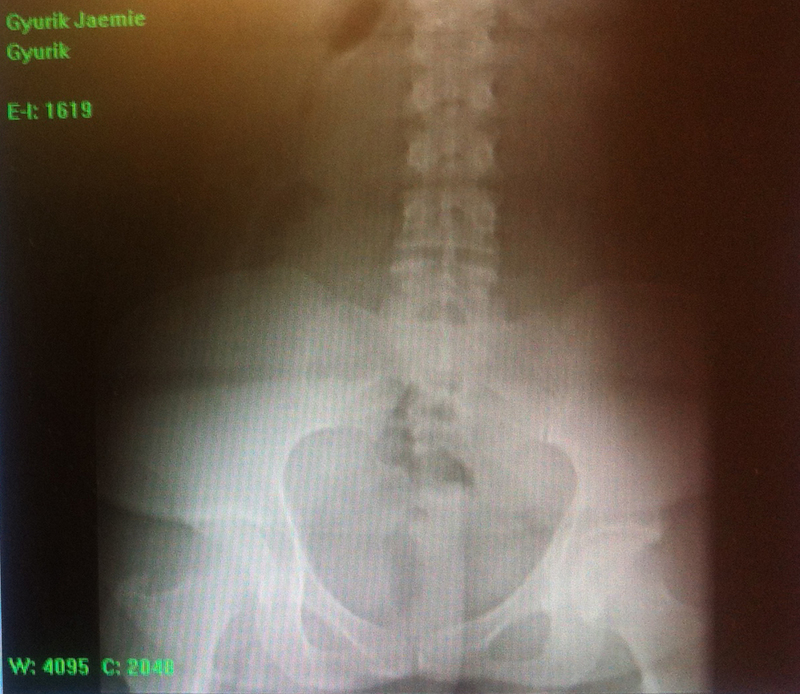 As we went through everything, I was starting to realize how weak and limited my right hip and leg are. (I had noticed that my right foot/leg kind of shuffle when I run, but I didn’t think much of it at the time.) I went back today for a follow up after the doctor had time to review my X-rays, and she went through them with me, showing me the bone-on-bone contact that my right hip is making in the joint and showing me how off balance my hips are (my right hip sits much higher and more forward than my left). So I wasn’t being a big baby about my pain. It’s a real thing with a real cause! Then the doctor said something that I wasn’t really prepared to hear: “We need to treat this now to avoid a hip replacement. You don’t want a hip replacement. You’re a runner. You don’t want one. They’re painful, and they only last for about ten years before you’ll need another one.” No, I don’t want a hip replacement. I had tears in my eyes when she said this (and as I write this) because this was the first time I had ever considered the possibility of my not being able to run. Right now I have the choice to run or not to run. I have a choice. Right now I’m struggling with running. Part of it is because of the pain I endure after the run, part of it is because of the weather (storms or heat – I can’t win), and part of it is because I’m struggling with some issues about my training process (post forthcoming). Realizing that running is my choice really put things into perspective for me. Of course, I’m not allowed to run for at least two weeks. Doctor’s orders. And what do I want to do? Run. If I don’t treat this now, in the future running might not be a choice for me to make. My doctor walked me through a treatment plan and explained how it will add more “space” around the joint so that the pressure will be taken off of the joint and I will be able to run pain free. It’s a pretty intensive plan: treatment three times a week for four weeks, then two times a week for four weeks, then either once a month or once every six weeks. All I have to say is that I am thankful to have insurance that covers this treatment, that I found a doctor that I like, that my doctor is confident that this can be treated through therapy instead of surgery. Often we forget that most of the time we have the option to make choices, but sometimes we don’t have options and the decision is made for us. Universe, thanks for the reminder. Wow Jaemie. I can’t believe we had the exact same news on the same day! What is it about Wednesday, huh? I am so so sorry you are going through this, but hey. You have company now. ME. I am curious about this chiropractic technique and maybe I can find someone here to do something similar to stave off my surgery for as long as possible. Did the doctor mention taking NSAIDs? I took a little trial of Voltaren last week and was amazed it made my pain VANISH. However, it also made my stomach kind of unhappy so I have to be careful and take it in concert with some other stuff. It’s all a balancing act, isn’t it? Pain vs inactivity vs medication vs surgery vs waiting …. it’s a lot to wrap our minds around. Hang in there, girl. We will get through this! My doctors actually want me to avoid taking meds (for now) because it masks the pain. I had three adjustments this week, and I have a little bit more mobility. I’ll email you next week to let you know how it goes. It’s going to e a long road, but we’ll figure it out!